Super Peruvian kitchen in Soho, trendy crowd and a queue out of the door!! This was my first Peruvian meal and it was absolutely delicious. I went here with the boy for dinner and really enjoyed everything presented to me. The waitress was lovely and recommended most of the dishes we chose. The food is presented tapas style and so they recommend around 3 dishes per person – this was not enough for me, I had 4 plus dessert and still had space for more, but I have been accused of having worms. Cancha – dry crunchy corn, strangely addictive bar snack. Not particularly flavoursome. Ceviche De Alcachofa – artichoke dish that made my mouth water for more. Gave the boy dark looks for eating more of it than he should have. Don Ceviche – seabass ceviche in amarillo chili tiger’s milk that has nothing to do with actual tigers milk thankfully. Choclo Corn Cake – a vegetarian cake, the only thing I didn’t like very much because it was un peu sweet. Amor Amar – king scallops cooked to perfection. Red Mullet – grilled, a bit bland compared to everything we had eaten beforehand but still nice. Some of the dishes were quite acidic, if you have a stomach ulcer this is not for you. I love lemon and lime so it was great for me but my boyfriend kept doing the squeezed lemon face in between bites though it did not stop him from eating everything lol. Loved the super Mario track in the bathroom. Only con – it’s a little squished. Book in advance!!! 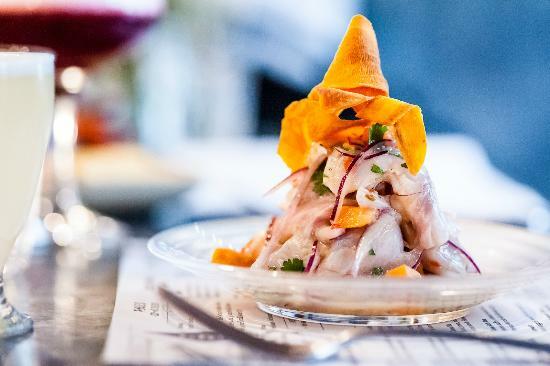 This entry was posted in Food Glorious Food and tagged Ceviche, eating out london, favourite restaurants, london restaurants, peruvian restaurants, restaurant review. Bookmark the permalink.